A number of children were hurt Thursday night when a car slammed into the front yard of a Harlingen home. The accident happened on the 100 block of East Madison Avenue right before 7:30 p.m.
Police say when they arrived at the home they found a number of children and one adult injured. All of them had been struck by the vehicle. The victims ranged in age from one to 28 years old and were taken to Valley Baptist Medical Center and Harlingen Medical Center. Two of the children were critically hurt, including a 1-year-old boy who is being transported to a San Antonio hospital. 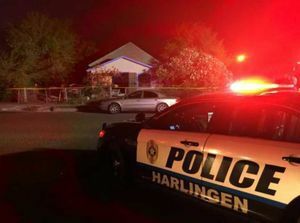 A 7-year-old girl remains hospitalized in Harlingen in critical but stable condition. A 28-year-old woman is in stable condition. Police say three other children, an 8-year-old girl, a 5-year-old boy and a 3-year-old boy, were treated and released from the hospitals. On Facebook, an aunt of the children said her niece and nephew were still alive contrary to reports on social media that they had died. The driver of the car is said to be a 65-year-old McAllen man. No charges have been filed.